Once the festive season starts, Amazon's Great Indian Festival cell has started again. 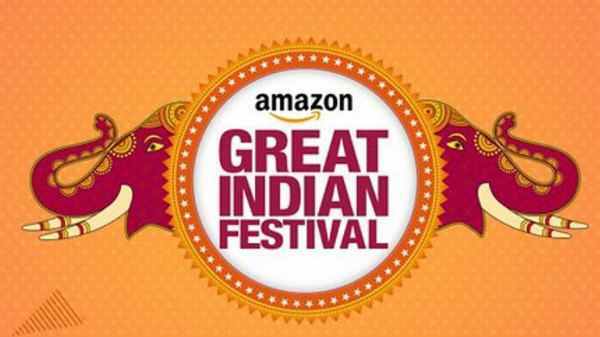 The Amazon Great Indian Festival Sale will last from October 24 to 28. During the Great Indian Festival cell, customers will be given the discount on multiple products and limited-period offers. Amazon has joined hands with ICICI and Citi this time. 10 percent discount on ICICI debit and credit card, the same is being given 10 percent cash back on payment by Citi Bank Credit Card. In the Great Indian Festival Sale, you will get offers like non-interest EMIs, exchange offers and free screen replacement. Remember that the Festive Dhamaka Days Sale of Flipkart, an Amazon company, has started from midnight. Amazon Pay user will get 10 percent cash back (up to 200 bucks) for putting money into the wallet. Let us know that this offer is valid only for today. The Amazon is also offering discounts to the Prime Members on select product. Apple iPhone X 64GB64 GB variant of iPhone X is being sold for a discount of Rs 74,999 (MRP 95,390 rupees). The Amazon handset was available for sale in the Amazon cell the last sale for Rs 69,999. Upon an old phone exchange, an instant discount of up to Rs. 16,854 will be available. You can also buy the iPhone X at an EMI with no interest. Free one-time screen replacement offers from Amazon for all smartphones sold during the Great Indian Festival Sale. The iPhone X features a 5.8-inch display with the Apple A11 bionic chipset. Vivo V9 ProThe MRP of VVO Pro 9 is Rs 19,990, but after the discount, the handset is getting at Rs 17,990. Upon an old phone exchange, an instant discount of up to Rs. 16,191 will be available. The Vivo V9 Pro has a 6.3-inch Full HD + Full View display with a Snapdragon 660 Ai chipset with 6 GB RAM. OnePlus 6 (8GB, 128GB)Customers can buy this handset at a price of Rs 34,999 after discounts of 5,000 rupees on one plus 6 (8GB, 128GB) variants. OnePlus 6 includes Snapdragon 845 chipset and 8 GB RAM with 6.28 inch Full HD + Amoled display. After taking advantage of the old phone exchange and bank offer, this phone will get you even more cheaply. LG 55-inch 4K smart LED TVThe MR 55X4K smart LED TV's MRP is Rs 1,01,990, but in the Great Indian Festival cell, you can buy this TV for Rs 74,990. This TV comes with LG's new Magic Remote and Voice Recognition Support. 3 HDMI and a USB port for connectivity. Samsung Galaxy A8 + (6GB, 64GB)The Samsung Galaxy A8+ (6GB, 64GB) variants are being sold with a discount of Rs 17,910. After the discount, the handset is now available for sale at Rs 23,990. Upon an old phone exchange, an instant discount of up to Rs 18,854 will be available. Galaxy A8 + has a 6-inch Full HD + Amoled display. A battery of 3,500 MAH batteries has been given to boost the phone. There are two cameras on the front panel and a 16-megapixel sensor on the back panel for selfies. Honor Play (4GB, 64GB)After a discount of Rs 4,000 on Honor Play, the handset is getting at Rs 17,999. Honor Play features 6.3 inches full HD + full view display and two rear cameras. For speed and multitasking, the phone uses 4GB RAM with a Kirin 970 chipset. Panasonic 49-inch 4K smart LED TVPanasonic 49 inch 4K smart LED TV is available for sale at Rs 52,990 after a discount of Rs 46,010. Panasonic's MRP of this TV is Rs 99,000. Explain that this offer is only for Amazon Prime Members. The TV includes 3 HDMI and two USB ports. One year free extended warranty and 2 month ACT FiberNet broadband subscription are being provided through the Amazon Third Party.